What's To Show After OKC's Last Preseason Game? 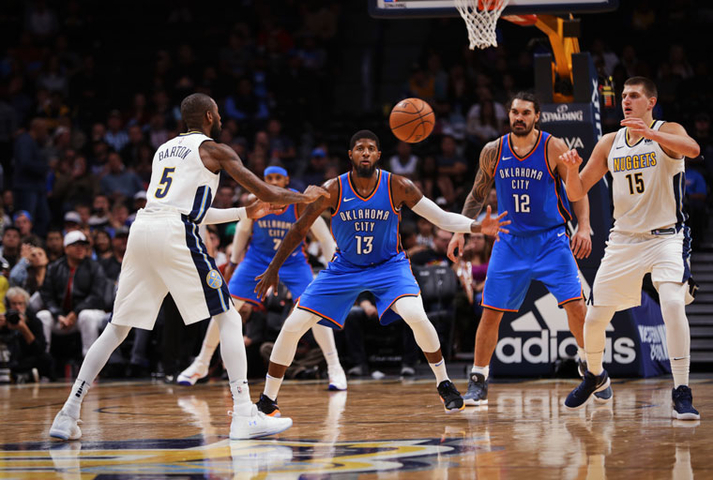 The Oklahoma City Thunder stepped up in their final preseason game by defeating the Denver Nuggets 96-86 on the road. All things considered, the big three looked as complete as they have all preseason. Josh Huestis displayed another facet of his game that adds more reason behind an increase in playing time this season and the team's defense looked solid as well. Russell Westbrook, Carmelo Anthony, and Paul George collectively didn't have a great game offensively and honestly got off to a sluggish start in the first half, by only shooting 15-of-31 from the field which was carried mostly by Russ. George and Anthony only shot a combined 7-of-20 from the field. George still found a way to be productive by adding 7 rebounds, 4 steals, and 3 assists to even things out a bit. He continued doing the dirty work until his shot started falling in the fourth quarter. He nailed four 3-pointers and ultimately closed the game out after several minutes of struggle from OKC's reserves. He finished the game with a double-double, 19 points, and 11 rebounds to go along with his 5 steals and 4 assists. His 36.8 percent shooting night wasn't as tragic of a statistic after the rest of his game played out. Melo struggled shooting as well but did a better job making up for it in the second half. In the first, his shots seemed to be falling short in route to a 4-of-11 shooting effort. In the second, he shot a better 3-of-6 from the field which resulted in a 7-for-17 shooting night. There were a few plays that showed a preview of how effective Anthony can be this year from the power forward position. In his later NBA years, playing the stretch-four could be more beneficial for him than it would've been earlier. Just like in April, Russell simply appeared to be locked in on the game from the tip to the time he left the court. He simply controlled the offense and it's clear that having two other offensively elite players helps his game in so many areas. His turnovers were down because he wasn't trying to force as much, he shot 9-of-13 for the game and his four misses came from long distance. His shot selection has undoubtedly improved from last season, again, because of his other two weapons. The Thunder's defense simply looked great. Holding what's expected to be a pretty intriguing offensive team that played their key players for the majority of the game to just 86 points is promising for the season. Denver also shot 34.1 percent for the game and 33.3 percent from long distance. They also compiled 16 turnovers, five of which were forced by George. Having two other wing players that can contribute defensively makes Andre Roberson's job immensely easier and allows him more energy on both ends of the floor. More so, having three wings that can play defense will cause a ton of havoc for even the NBA's best offenses. For the second straight game, Josh Huestis continued his campaign for playing time in a different way than he did against Melbourne. Instead of being a defensive specialist from the power forward position, he decided to display his multi-faceted talent by stepping out and nailing 3-point shots with consistency. Huestis shot 4-of-9 from three and finished with 15 points to go with 9 rebounds. Once again, Huestis probably isn't the guy to play throughout the game but he has the skill set and the ability to play 12-15 minutes per game either at the small forward or power forward position. With the preseason now concluded, the Thunder have eight days until their highly anticipated season opener against the New York Knicks where Melo will return to Madison Square Garden for the first time since being traded. Enes Kanter will also get a chance to play his former team for the first time after an emotional departure.